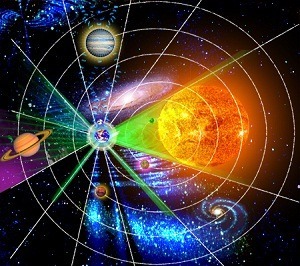 In astrology, the “personal” planets are defined as Sun, Moon, Mercury, Venus and Mars. Again, to emphasize that your birth chart is made up of much more than your “Sun sign.” Since most of us know so much about the Sun signs, lets discuss Mercury through Mars – they are often ignored. These planets make up much of your personality and can vary widely. Since Mercury and Venus orbit closer to the Sun than the Earth, they can only reside in a few signs per Sun sign. In other words, all Cancers that have ever lived have their Mercury in neighboring signs or Cancer itself, i.e., Gemini, Cancer or Leo. Likewise with Venus which has a wider orbit of 5 signs, she can only reside in the same sign as the Sun sign or in the neighboring 2 signs. Therefore, anyone born under the sign of Capricorn would have their Venus sign be in Scorpio, Sagittarius, Capricorn, Aquarius or Pisces. Basically, since the Sun represents our very core of our expression; much of our personality, what do these other planets rule or represent? MOON – Although the Moon is not technically a “planet,” she sure is astrologically. She’s probably the most complex of all 11 planets (including Chiron and Pluto.) Representing the feminine, she rules such a wide range of topics such as Goddess, women’s issues, family, home, nest, upbringing, birthing, property, land, tradition, personal habits, one’s comfort zone and on and on. The Moon is clearly the second most important (besides the Sun) planet in your chart. It has a lot to do with your emotional nature and frequently hints at the nature of you and your nurturing parent. Sometimes that someone can be the father or a grandparent, but most times is the Mother figure. Not only does she represent the mother; the Moon often gives us clues about our past lives. It is of utmost importance that the Moon be well placed and not stressfully aspected. I can’t go into what makes up a healthy Moon here however, a subject that could require a volume to itself. A well placed Moon usually indicates that the native is rather easy to deal with. Things come and go. On the other hand, it is a safe bet that the people you know with the highest degree of uneasiness in general have “troubled” Moons; many times called “high maintenance.” As I said, the Moon requires great analysis and is very complex. Usually its basis is simple, the child wasn’t allowed to be – to simply be him or herself. If the parent struggles within, usually, but not always, the child follows suit. Many times it’s because the parent or both parents just had too much emotional baggage. Period. That’s quite the words for the Moon: emotional baggage. If that is the case, which sadly is extremely common, the forgiveness of said pain is not always a simple matter to effectively heal. This subject can become so complicated that I simply can’t go into it here. Suffice it to say that many people with “troubled” Moons are just seldom comfortable in their own skin. The Moon is like our sponge that soaks up the parent’s emotional nature(s) and that of our environment. Many times we see couples who appear to be oddly matched, only to find out that their Moons, when compared to one another, are in a harmonious formation when we compare the couples’ charts. They simply feel good together. Inversely, we sometimes find couples that seems to be perfect together. On further analysis, if the Moons align in a stressful manner, there’s often little they can do to overcome it. Your nature is your nature. You’re a hard chair. I’m a soft couch. It is of the utmost importance that you understand your own Moon’s nature especially when comparing your natal chart to others’. The Moon also has a lot to do with people identifying or not identifying with their Sun sign. For example: I know Cancers who have a Moon in Aries. Their basic hypersensitive nature is greatly toughened up by the Arian Moon. They’ll often say, “Reading Cancer doesn’t sound like me!” It doesn’t. Another: Let’s assume we have a person with a Capricorn Sun who reads in the books how they’re not that emotional only to find their Moon in Pisces. This Sun-Moon combination can make the native very sensitive. Some people are just “too much.” What does that mean; for example: if you have a Taurus Sun with a Moon in Capricorn (double-earth), you can be way too “fixed to practicality.” Another example: If a Leo has a Moon in Aries, there just might be too much firepower for most people (including the native) to handle. A nice combination of Sun and Moon is optimal. MERCURY – The communicator. Mercury has everything to do with the mind; the computer itself and how we communicate. Since we only have 3 possibilities of where our Mercury can be… It describes how we think; what we think about; do we worry; how we analyze, etc. Take the sign that the Mercury is placed in and that will tell you much about how to address them. For example, many Cancers need to be addressed very politely and gently. However, if their Mercury is found in Leo, they can handle a fiery intellectual interchange more that you might think. Many people think Virgos are so exacting, while many are. On the other hand, some have Mercury in Libra, which makes them much more amenable to matters of gray as opposed to black and white. They can actually be quite indecisive; not a Virgo trait at all. So, we see that the sign that in which Mercury is placed colors the mind greatly. Sometimes we see Sagittarians, known for their fun-loving nature, who have little sense of humor only to find their Mercury in somber Capricorn. Suffice it to say that a healthy Mercury in a person’s chart indicates the way their mind works. If you happen to notice over a period of time, a person changing the basic way they think, that’s usually because a significant planet is transiting over their Mercury. This is very common. I notice my own Mercury in lively Sagittarius cools it quite a bit whenever serious Saturn aligns with it. During those times, I feel like tempering myself more. A person’ Mercury tells us much about how their onboard computer works and what types of programs they are running. VENUS – Venus is Yin, Mars is Yang. We all have both. Venus is the feminine, receptive side of you. How open are you to others or to life’s beauty? Are you receptive as is Venus in Pisces, the ultimate? Are you real picky and finicky about what you let in? Venus describes how we like to be treated. Find out where your mate’s is and that’s a great clue as to how to treat them – what types of things they like to do. What types of things they are interested in. A troubled Venus won’t let things in and often comes from the upbringing. Not always. It is not easy to change Venus’ nature because it’s such a part of a person. This is one reason these 5 planets are called personal! Fear is the number one enemy to Venus. Fear of letting someone close; they might hurt you. On the other hand, an excessive Venus lets everything fly! Not always promiscuous, these placements of Venus just don’t know when to say NO. They have no innate understanding of limitations. They can get in lots of trouble; financially too, spending vapor-money that they don’t have. Needless to say, it’s very important to have a balanced, healthy Venus. Then, you let people in and treat them and yourself “right.” There’s no codependency, neediness, coldness, aloofness – things are just right. Venus is EXTREMELY important in a chart and usually describes (in addition to the Moon) a pretty clear picture of a person’s emotional nature. Now, do you see why Sun sign comparisons are almost useless? MARS – Mars has no charm (unless it’s in Libra.) It’s not meant to. Mars indicates your “male” side. How do you go get things? Do you beg? Do you run people over for a single Cabbage Patch Doll? Are you independent? Do you feel that you don’t deserve anything good? These are all indicated by the sign and aspects reflected by the position of your Mars. I want my running back to have Mars in Aries, or Leo, or Scorpio. You don’t want it’s placement to be too overbearing, yet, you don’t want it to be weak either. In this world, you have to get up and go, do, accomplish things, and use your power. No one wants to walked over as well as, people get real tired if they have to read your mind. Again, you have to find a balance. If you are a Leo who sometimes can be overbearing, having Mars in Cancer or Libra will certainly soften and balance you. If you are a Pisces, many people expect you to be “weak-willed.” Well, if your Mars is in Scorpio, that’ll take care of that. Remember, since Mars’ orbit is beyond our, Mars can be found in any one of the twelve signs for all of us. This is no coincidence that we just landed the new rover Curiosity on Mars. It never is. It tells me that humans are now READY to start looking at other answers besides aggression for problem-solving. So, we see, we need a balanced chart, and that’s not easy to accomplish. It may take many lifetimes. Sometimes I see chart of people that are so beautifully balanced that I gasp. It’s no wonder they feel the way they do to us. Who knows why our planets are where they are. “Karma” is a glib, easy answer. We have to deal with the hand we have been dealt. This is why it’s absolutely one of the best things you can do; get to know where all of your personal planets are. Look up your loved ones too. This can be done with or without the birth times at www.astro.com. Then, you can see your particular coloring. Not all red paintings are completely red. Not all yellow paintings are completely yellow. Yes, many blue painting are pretty much blue. See what colors you made up of. 9/1-3 Venus squares Saturn – Not the best time for relationships. A very good time to get things out on the table and face difficult issues, yes. Saturn is saying, “OK, what exactly IS this relationship?” No hiding, no faking it. A great time to get real and fix communication problems. A real bad time to rest upon codependency. 9/15 New Moon 23°c37′ 10:11p – The New Moon in Virgo will certainly help us get on with things matching this month’s theme, i.e., “Get back on that horse and ride, no more excuses!” It’s that simple, Virgo is simple: no whining – get to work. I’m sorry. 9/18 Pluto goes Direct 1:05a – As Pluto shifts for the whole world, we once again see the overall theme we’ve been under for 4.5 years, let go of the old, get real. Get real. Get real. If you don’t, you’ll have “unreal” things happen “to” you. Pluto is passion. Where is your passion? How have you been respecting it? 9/22 Sun enters Libra 10:49a – You can just about forget this one. Usually, the Sun’s ingress into Libra is very mild, welcome and pleasant. This will hardly be noticed with all the tension from massive Uranus and Pluto. Nevertheless, I hope you all have a few pleasant days and treasure your relationships. Toast a few. 9/27-29 T-square to Pluto – Formed by the transiting Sun, this massive triangle culminates with the Full Moon on the 29th in Aries. This will be no picnic under the stars. Time to act. Time to act. Time to act. Do what you must do. There is no one else here. You are alone. You must act on your life purpose. Can’t you see it all around? No more blame game. Spread your genius! 9/29 Full Moon 7°^22’ 11:19p – The Sun triggers the Uranus/Pluto square on the 28th, so it should be very explosive like the other ones have been. There is no way to predict the outcome other than once again to say that long-held problems that we have been unable or unwilling to solve rear their heads again. Your power wants OUT. Own your power.